Of all the sectors of the safety market Fall Arrest is one of the most complex, with every different scenario requiring a different solution and a different level of understanding. It is also one of the least understood and most often poorly addressed areas of personnel safety, whilst remaining one of the few sectors where the result of a wrong product decision or poor working method will almost certainly result in the death of a worker should a fall occur. Following the hierarchy of fall protection as described in the Working At Height Regulations, Fall Arrest PPE is the final resort. 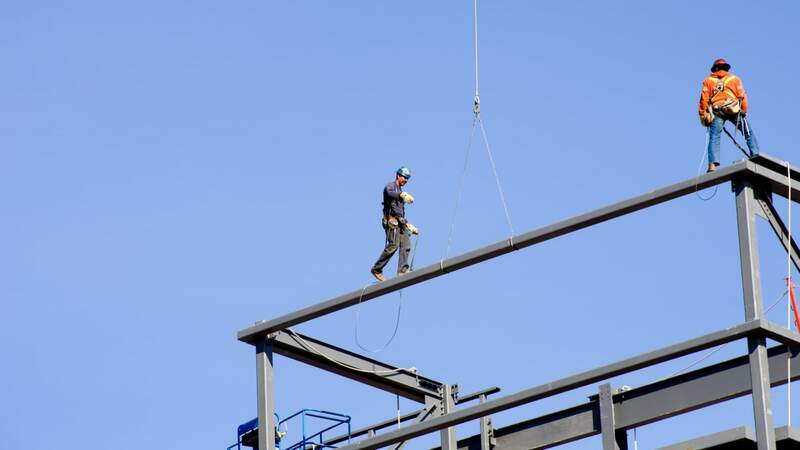 The reason for this is that to work in Fall Arrest situations means that the worker is being subjected to a risk of injury at least, even with fall protection equipment supplied and used correctly. The Health and Safety Executive require that no worker be placed in such a situation where it is physically possible, and that all measures to eliminate any potential risk be considered first. Falling just a short distance can generate extremely high loads on the workers body, in excess of 1,500kg! Without a shock absorber built into the fall arrest system these forces will severely injure the worker and more than likely result in a fatality. There was an instance in Europe in recent months where a worker had fallen with non-shock absorbing equipment and survived until reaching the ground when they unfortunately died from internal injury, caused by the compression of their body by the harness due to the extraordinary forces involved. With a shock absorbing device this worker would have survived. The other dangerous area in the Fall Arrest Equipment sector is the belief that all equipment is the same. The idea that every product is equal just because it meets the same European Norm is flawed to a massive degree. Take the example of a full body harness. The web of a harness must take a minimum of 22kN (2,200kg force) before breaking in order to pass the European requirements. This web is then open to the elements, the rigours of industry, and poor maintenance regimes. In a series of tests carried out by independent test houses a few years ago a large number of manufacturers products were subjected to ultra-violet light tests, the levels of which were set as for the United Kingdom for the equivalent of a year. They were then re-tested to the EN standard. Almost all failed. The point here is that not all products are equal, regardless of the standards to which they are tested. Some manufacturers choose to just meet the standards, whereas those at the high quality end of the market ensure that materials used in the construction of the web itself and also the thread used to build the harness is capable of passing this EN test years after being put into use in the most rigorous environments. The EN and CE stamps are no guarantee that the product, be it a harness, lanyard, rope system or self-retracting lifeline, will last 5 months, let alone 5 years. European Directives and protection against falls from height. PPE equipment designed to protect professionals from risks associated with a fall from height make up part of Category III: Protection against mortal dangers or dangers which could seriously and irreversibly damage health, or those whose effects can not be ascertained at the appropriate time. Under European Directives all Personal Protective Equipment is required to be supplied as ‘fit for purpose’. This includes Fall Arrest Equipment. However, as already mentioned, the choice of equipment rarely focuses on providing the perfect solution to the situation at hand, rather on providing the closest possible within a budget to cover the legal requirements. This is Safety for Compliance. The correct way of selecting equipment is to first assess the risk to the worker, consult an expert in fall protection if necessary and then select the best equipment based on performance and suitability for purpose, taking into account, in all instances, the provision of worker comfort and rescue capability. In the United Kingdom there is a British Standard dedicated to this practice, BS8437:2005 Code of practice for selection, use and maintenance of personal fall protection systems and equipment for use in the workplace. This is Safety for Safety. Within the framework of the implementation of the 89/686/CEE directive, the European Commission has published a certain number of standards intended to control the design and use of rescue and personal protection equipment against falls from a height. These standards must be adhered to, and are applicable in all the member states. All fall protection equipment must have the relevant EN code and CE mark clearly shown before the product can be sold and used. These manufacturing standards are extremely important to the safety of personnel. For example, if an EN 355 Shock Absorbing Lanyard has the karabiner or hook replaced with a different hook two things are required to be checked. The hook must be checked that it conforms to EN 362, and that it also conforms to the testing parameters of the lanyard’s original EN 355 test. If the hook does not conform to the latter section then it cannot be used, even if it has the EN 362 conformity. The key section in these standards is EN 363. All Fall Protection systems that utilise PPE must conform to this standard, although you will never see it printed on any product or documentation. It is essentially the standard which ensures that PPE governed by all the other EN standards will interact in the correct and safe manner. “CE type” certificates are issued for an unlimited period of time. A manufacturer must only recertify a product if a major change had been made to its construction, performance, or, in the case of considerable modification, to the manufacturing process. This is the reason that a lanyard, for example could not be used with a different connector than that used during its initial EN 355 testing. Fall Arrest Systems are essentially a collection of equipment conforming to the required standards, used in conjunction with each other to ensure the safety of a worker whilst working at height. As previously noted, correct selection of this equipment is vital. A simple way of remembering the core components of a fall arrest system is the ABC of Fall Arrest. An anchorage is a secure point of attachment for the fall arrest system. The anchorage must be capable of supporting the load of a fallen worker, (12kN) or shall be designed, installed and used as part of a complete personal fall arrest system which maintains a safety factor of at least 2:1, given that the maximum load permissible to be applied to a falling person is 6kN. Anchorages may be certified (designed or engineered on site for fall protection) or non-certified (beams, trusses or other suitably strong structures). Certified anchorages should be identified with paint or special markings and kept on a site location list. Anchorage connectors are greatly dependent on the specific requirements of the purchaser, including the type of attachment, the environment and the connecting system. Anchorage connectors provide a means of attaching the system to the anchorage. These vary widely depending on application. Some of the common types are anchor slings, roof anchors, beam clamps, rail sliders, trolleys, eyebolts and large opening snap hooks. A full body harness is designed with straps to fasten around the user in order to distribute fall arrest forces over at least the upper thighs, pelvis, chest and shoulders. This moves the impact of a fall from the internal organs to the major bone and muscle groups around the pelvis. The full body harness includes a means for attaching to the other components of a fall arrest system. Harnesses must meet the European standards for manufacture and bear the CE mark. The fall arrest point must be located on the back, positioned between the shoulder blades. No matter what additional anchor points are included on a harness, it must always include the dorsal attachment. Webbing is an important factor in the durability and safety of the harness. You want to ensure that the webbing is strong enough to endure rough use and exposure to sunlight and other elements without tearing or fraying, yet at the same time stay soft and feel comfortable for the user. Kevlar® webbing is used for specialty applications such as welding that require fire resistance. Whether you wear a harness four hours a day or fourteen hours, it needs to fit right for safety and comfort. Harnesses with adjusting points on the legs, waist, chest and shoulders allow for a better fit. The sub-pelvic strap provides additional support, security and comfort for the user. Properly positioned, it better distributes forces during a fall. Some harnesses feature book-style labels that put product and inspection information at the workers’ fingertips, whilst remaining protected from the elements. Pages may include sizing, operating instructions, inspection log, warning labels and compliance information. This type of labelling promotes safe inspection, compliance and safety. Double box stitching provides maximum strength and durability. Sewn-in quality you can trust to remain intact should you have to put it to the test. Some harnesses come complete with an impact indicator, either in the form of a breakable stitch or visible indicator on the rear D-Ring. This allows anyone inspecting equipment on a daily basis or in an annual recertification inspection to immediately tell if a harness has been subjected to a fall. Should a fall occur the harness should be removed from use immediately. Lanyards are flexible lines with a connector at each end used to connect the anchorage to the body support of a fall protection system. Lanyards should be connected to the back D-ring for fall arrest, located between the shoulder blades and ideally should be anchored above the worker to minimise fall distance. The worker should not walk too far from the overhead anchorage or a swing fall may occur. Rope or web lanyards without shock absorbers may be used for applications that require positioning or restraint of a worker to prevent any fall risk. Lanyards used for fall arrest must include a shock absorber to dissipate the energy of the fall, limiting the forces on the body of the falling worker. This style of lanyard is used to provide 100% tie-off. It allows you to stay protected while you move from one location to another. This is the safest form of lanyard as at no point is the user unprotected and, used correctly, ensures 100% safety. Health and Safety Executives prefer this type of connection above standard lanyards for this reason. Lanyards designed for use as part of a personal fall arrest system must contain an energy absorbing unit that will limit the force on the worker to below 6kN. Some manufacturers now keep arresting forces below 4kN. Webbing is an important factor in the durability and safety of the lanyard. You want to ensure that the webbing is strong enough to endure rough use and exposure to sunlight and other elements without tearing or fraying. Webbing may also be coated with polyurethane to provide protection again grease, oil, dirt and grime. If the lanyard has been used to arrest a fall or if the energy absorber has been deployed, the lanyard must be retired immediately. An impact indicator gives easy visual reference of a blown shock. Most lanyards are available with traditional auto-locking snap hooks. There are also specific snap hooks which allow one-handed use with no pinching of thumbs or fingers. Lanyards can also be fitted with larger snap hooks or karabiners for connection to larger anchorages. Standard lanyard length is 2m. A lanyard should be long enough to be user-friendly, but kept as short as possible to minimise the free fall distance. Knots should never be tied in lanyards to reduce their length as this can reduce the strength by 50%. An SRL is a flexible lifeline attached to a mechanism that allows it to extend and retract under slight tension when the user moves away from and toward the device. This enables a user to work safely while moving within a recommended area at normal speeds. SRLs can be used in a variety of situations, but are primarily used to provide movement and protection of users in a vertical work area. The SRL should be anchored to a location directly above the user. SRLs can also be used with a horizontal lifeline to improve the overall mobility of the system. The SRL casing protects the inner parts of the SRL and holds the excess line when not in use. Durable, impact-resistant housings offer longer wear and greater protection of the brakes and retraction springs. Environmentally sealed SRLs isolate the critical working components, protecting them from the dirt, oil or grease that the retracted cable can bring inside. SRL lines can be made from cable, webbing or synthetic rope. Cable is considered for rugged, outdoor applications or where the line may be in touch with sharp objects. Web is a more lightweight, compact choice, often preferred indoors for less industrial applications and for warehousing. Stainless steel offers the ultimate in corrosion resistance, reliability and longevity. SRLs should be inspected before each use and monthly by the customers’ designated competent person. Inspections are made easier with an impact indicator that immediately shows an orange or red band if the SRL has been loaded or has arrested a fall. All SRLs should be removed from service following the arrest of a fall. In most cases the unit will have to be returned to an authorised service centre for servicing or replacement. The snap hook affects ease and speed of connection. A swivel snap hook provides versatility to allow the SRL to be easily connected to a wide variety of anchorages, making it adaptable to different work structures. Some SRLs have an emergency reserve lifeline feature which means that if a worker has nearly all the line extended and experiences a fall, the unit will still be capable of absorbing energy and keeping the arresting forces to a minimum. Some SRLs incorporate a built-in winch retrieval mechanism. These units not only provide fall protection as a worker enters a confined space such as a sewer or tank, but also allow activation of a retrieval mechanism for fast, convenient rescue. With a 3-way SRL, raising and/or lowering operations are fast and convenient. Many industry SRLs use a seat-belt type extension and retraction mechanism. Some of these SRLs can be set too sensitively which can lead to the brake locking when you don’t want them to. This leads to worker dissatisfaction and lowered productivity, and in the worst cases there is the potential for the worker to refrain from using the SRL. However, there are SRLS on the market that feature anti-ratcheting, twin disc brake mechanisms that provide smooth operation and lock only when you are ready, due to correctly set inertia braking systems. Once the mechanism engages, it stays locked, ensuring that the worker is not ratcheted down to the ground. A fast acting braking system that reacts in less than 0.6m will ensure both the lowest possible forces on the body, and also facilitate a rapid and safe rescue. Returning to the beginning of this article, it was noted that the Fall Arrest subject is one of the most complex in the sector, with every different scenario requiring a different solution and a different level of understanding. By proper and thorough research following a risk assessment the correct equipment can be selected, the correct training provided and the correct methods adopted to ensure Safety for Safety, rather than Safety for Compliance. To adopt this strategy to Fall Arrest ensures that the right of every worker to return home safely every day is met.